Encountering experiences and memories of older people and reflecting creatively on beliefs and values. 30 Year 8 pupils with a teacher and classroom support assistant. The centre was within walking distance. Half a dozen pensioners, members of a local project Sharing Memories, joined us and we booked a community artist. Teachers from the art and RE departments discussed aims and possibilities. We also talked to a community artist with experience of building bridges between older and younger generations. From these discussions, we planned a joint activity and piloted this with a Year 8 class over a full day. Normal parental permission was obtained. Children were carefully prepared on the expectations. The start of the unit focused on a visual stimulus, using pictures by Dali and Chagall, to consider the symbolism of the Last Supper and Crucifixion from Christian and Jewish perspectives. Pupils were asked to bring in a shoebox filled with symbolic items that represented important aspects of their lives. The older people also brought symbols or items that reflected important events, beliefs or moments in their lives. This process enabled pupils to see how identity and values can be expressed through symbol and picture as well as words. Pupils were then asked to imagine they were leaving the country to emigrate elsewhere; their task was to design a ‘memories sheet’ that showed how they want to be remembered. They could use pictures or words to represent their hopes for the future. 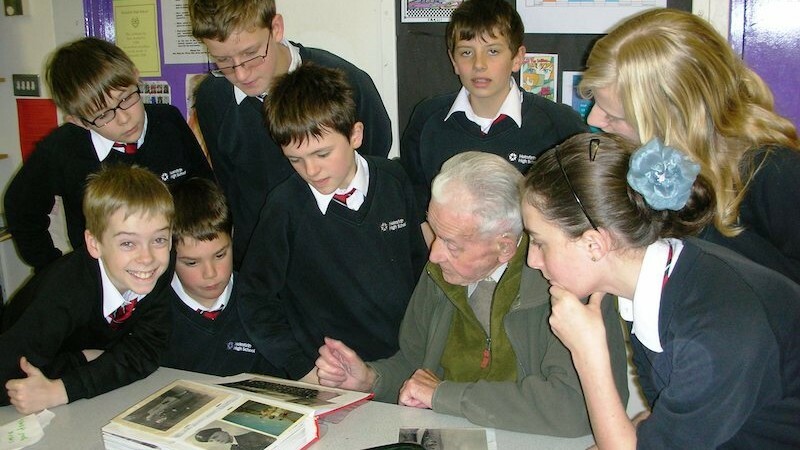 Pupils gained knowledge and understanding of how remembering the past informs values today. Many were struck by the memories of the older people and demonstrated a sense of empathy. Pupils also felt they could express their views and beliefs in different ways and they were able to express values and feelings more powerfully. This work has had an impact on teachers and pupils. Working together and planning an event out of school was not as time-consuming or difficult as we feared. Pupils enjoyed and valued the interface with older people and the chance to express themselves in a different way.